There’s something so magical about the Christmas season. 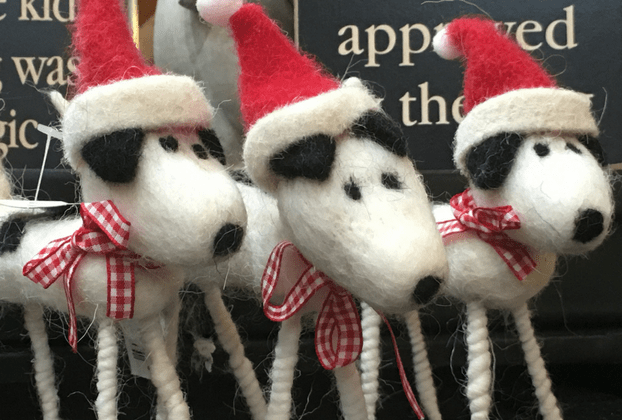 One of my favorite things to do during the holidays is to check out the holiday store decorations, hotel displays and home tours. 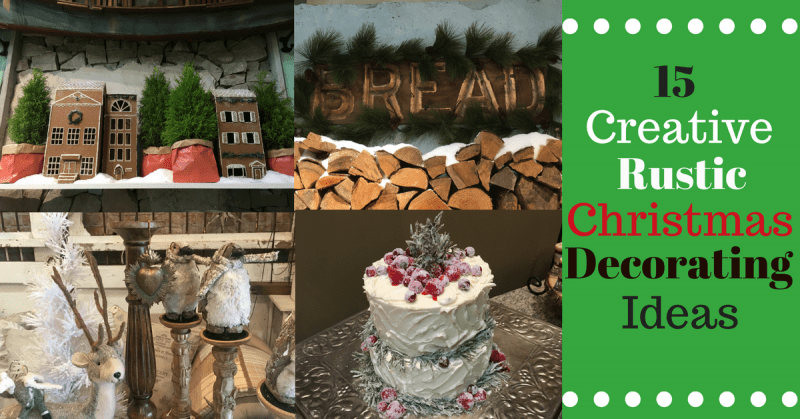 15 Creative Rustic Christmas Decorating Ideas will help jumpstart your holiday decorating at your house. Shop owners know how to decorate and show off their wares in the best light, so I love to learn from the best. I also have pictures I took from holiday decorated homes so you have a nice selection of ideas to pick from. 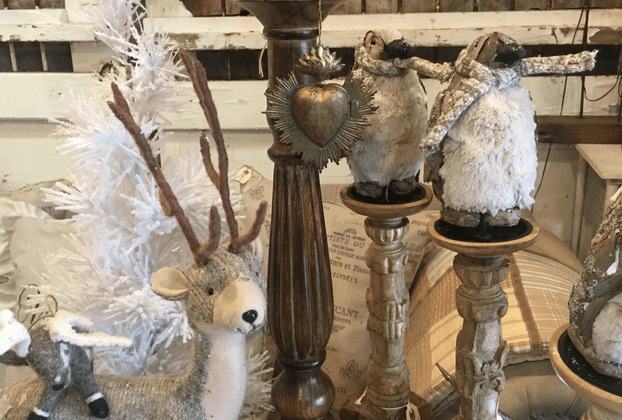 Now you can see the latest holiday displays to use as inspiration to create your own Christmas magic throughout your home. 1) Outdoor giant gingerbread house. The perfect definition of go big or go home. 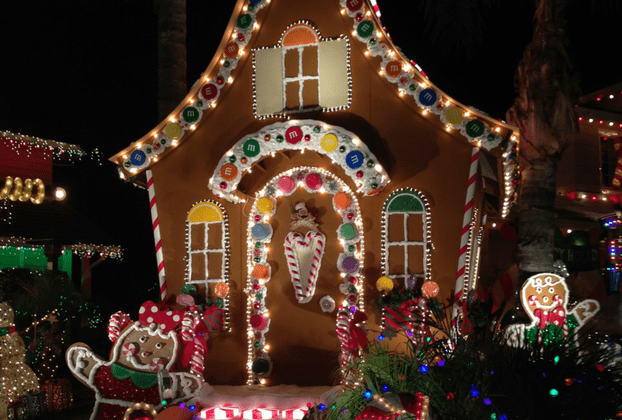 This amazing outdoor gingerbread house is handmade and was on an outdoor Christmas lights street display. 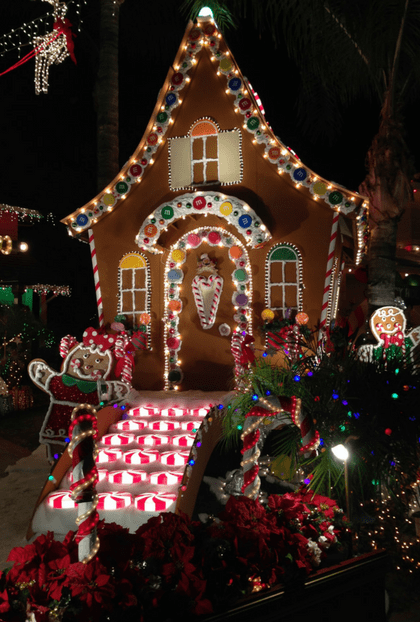 The street was in Santa Clarita, CA and it’s one of those neighborhoods where everyone goes all out and decorates their home to the max. 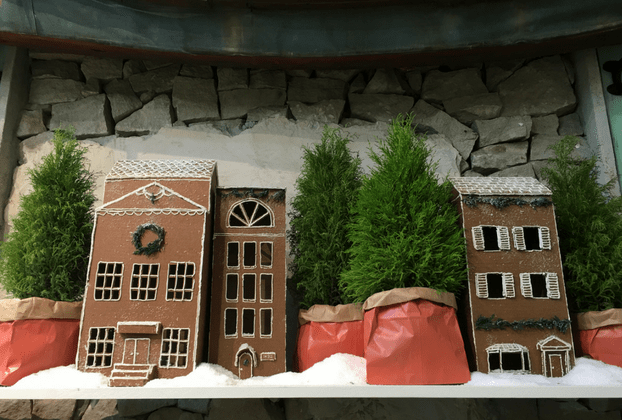 If you’re ready for an advanced level of holiday decor, then this gingerbread house is the perfect way to become the neighborhood wonderland. Who knew that wrapping the base of your small trees would look so amazing dressed in a festive sack? Add a couple of simple faux gingerbread houses and you have a stunning design. I found this display at the Anthropologie store in Seattle, WA. I love, love, love this idea. 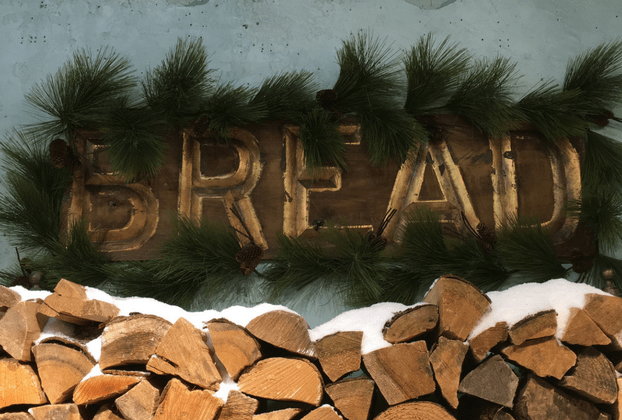 Add a garland of greens to a rustic sign in your home and then stack some wood below it and sprinkle with faux snow. Rustic doesn’t get any better. I also found this display at the Anthropologie store in Seattle, WA. 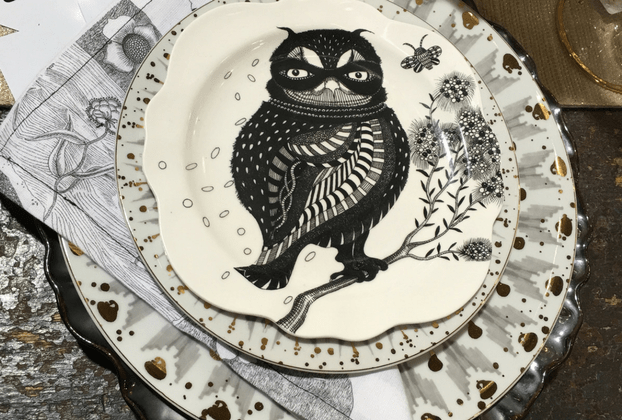 Instead of the traditional Santa plates, how about having a winter woodland theme for your dinner table? This place setting was also found at the Anthropologie store in Seattle, WA. I’m not a big fan of real animal heads on a wall, but faux animal heads are a completely different matter. 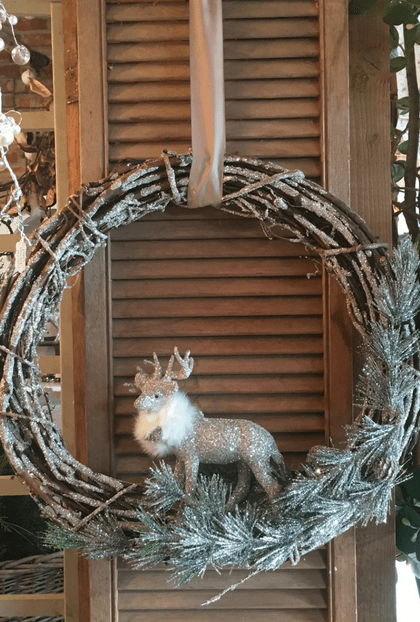 Add a festive wreath and you will have a perfect focal point for any room. 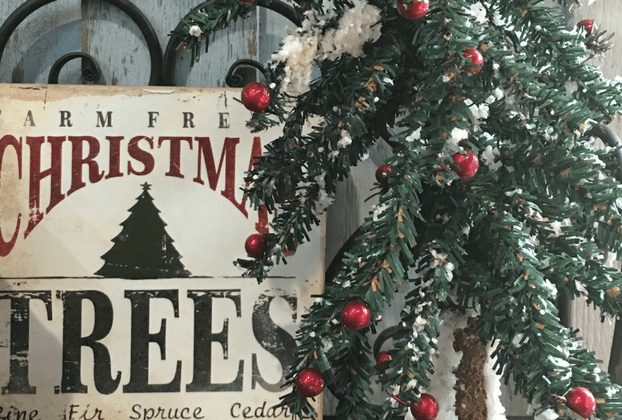 What would show off a vintage inspired Christmas tree sign? A small tree next to it of course. This cute little set of puppies might not be rustic, but I just had to include them they were so adorable with their sweet Santa hats. Adding a pair of vintage skis to a tree makes a stunning statement. 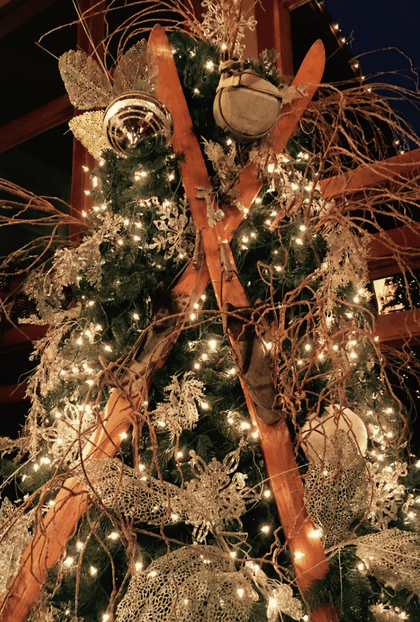 This tree was the centerpiece in a rustic lodge hotel. 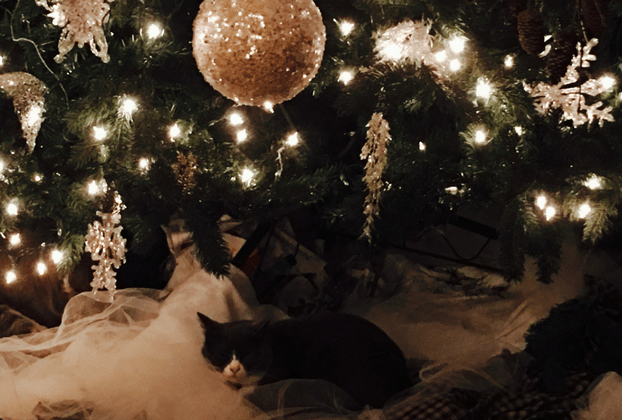 As an extra bonus, you get to see the hotel’s resident kitty relaxing in the magical scene. 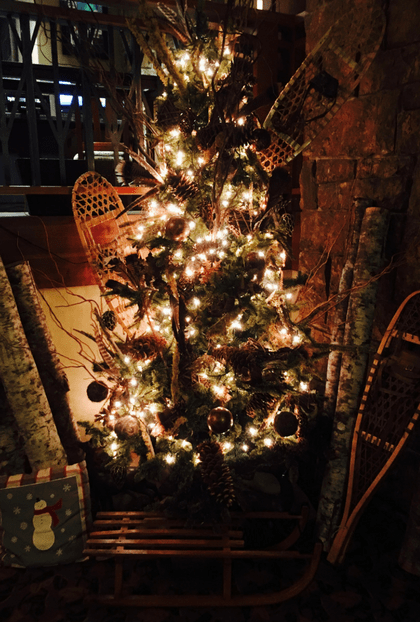 Look at how cute these rustic snowshoes are peeking out from the tree. Add a couple of birch logs and your tree has that rustic look you crave. This gorgeous wreath is simple, yet makes such an amazing statement. 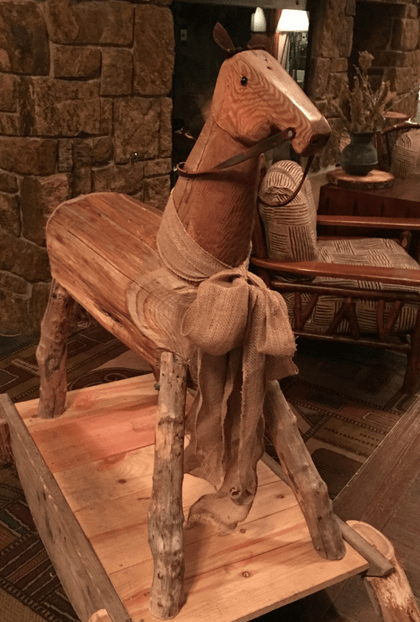 A wooden rocking horse adds a festive accent to any room. Add a burlap bow and you have the perfect welcoming touch. 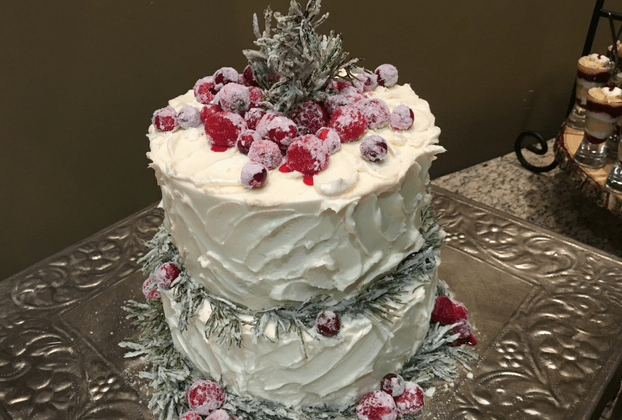 This cake was just gorgeous with the simple additions of rosemary and sugared fruit. 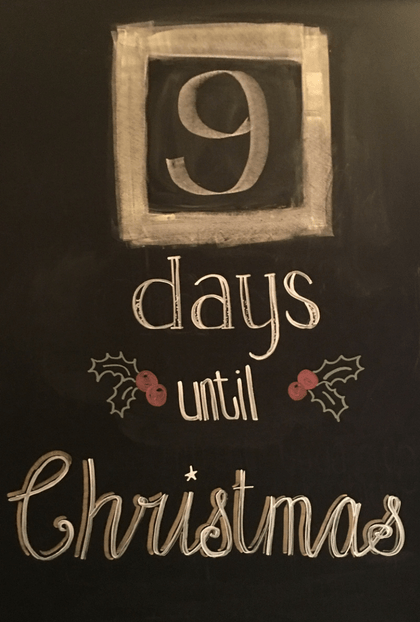 A chalkboard is the perfect way to keep track of how many more days there is until Christmas. 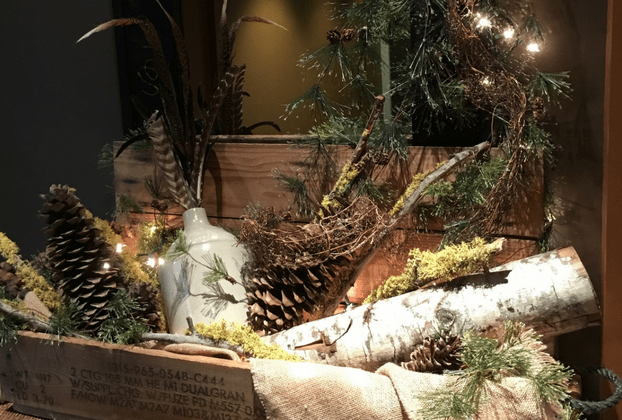 A vintage wooden box with a stoneware jug, white lights, pinecones and evergreen make the perfect combination for your holiday decor. 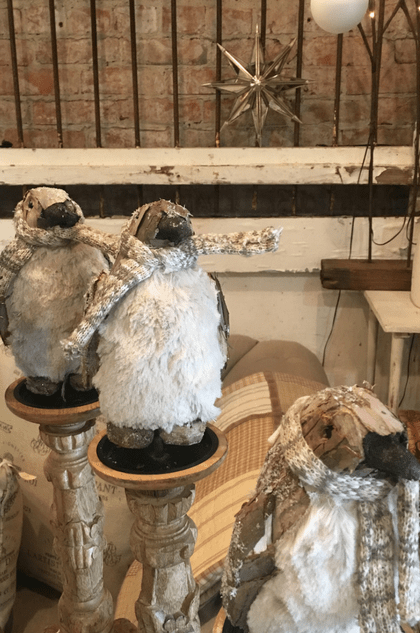 Why hide your adorable penguins on a shelf somewhere? 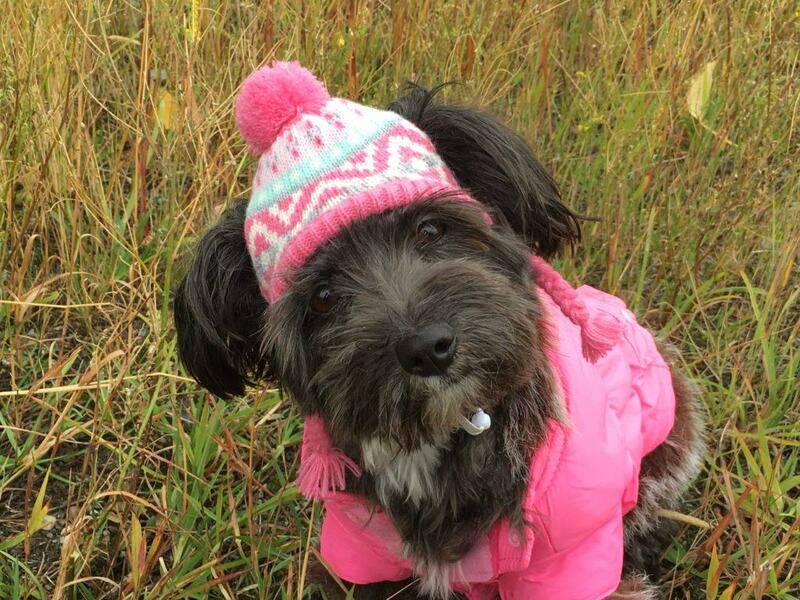 By giving them their each pedestal, you create a parade of cuteness. 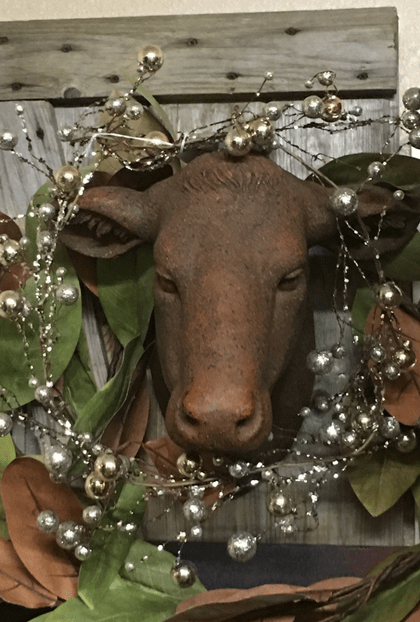 We’ve reached the end of 15 Creative Rustic Christmas Decorating Ideas. I hope you got a couple of ideas on ways to decorate your home for the holidays. Make sure you sign up to receive every post. You wouldn’t want to miss other great articles like Old Fashioned Christmas Ideas – 55 Ideas for Holiday Fun or recipes like To-Die-For Rustic Hungarian Mushroom Soup.